Alciato at Glasgow: Emblem: Tandem tandem iustitia obtinet. Gerechtigkeyt sigt doch zu letsten. Emblematum liber (28th February, 1531), Augsburg: TANDEM TANDEM IUSTICIA OBTINET. Emblematum liber (6th April, 1531), Augsburg: TANDEM TANDEM IUsticia obtinet. Emblematum liber (1534), Augsburg: TANDEM IUSTICIA OBTINET. Emblematum libellus (1534), Paris: Tandem tandem iusticia obtinet. Livret des emblemes (1536), Paris: Tandem tandem iusticia obtinet. A la fin obtient Justice. Les Emblemes (1539), Paris: Tandem tandem iusticia obtinet. A la fin obtient Justice. 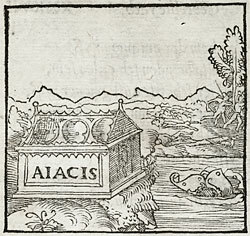 Les Emblemes (1542), Paris: Tandem tandem iustitia obtinet. A la fin obtient Justice. Los Emblemas (1549), Lyon: Que alfin alfin la Justicia vençe. Emblemes (1549), Lyons: Finalement Justice obtient. Emblemata (1550), Lyon: Tandem, tandem Iustitia obtinet. Emblemata (1551), Lyon: Tandem, tandem Iustitia obtinet. Diverse imprese (1551), Lyon: Che nel fine la Giustitia ottien sua ragione. Emblematum libri II (Stockhamer) (1556), Lyon: Tandem tandem iustitia obtinet. Toutes les emblemes (1558), Lyon: Finalement Justice obtient. Liber emblematum ... Kunstbuch (1567), Franckfurt am Main: Tandem tandem Iusticia obtinet. Es wirt letzt ein mal die gerechtigkeit siegen. Emblemata / Les emblemes (1584), Paris: Tandem tandem iustitia obtinet. En fin le droit obtient sa cause. Emblemata (1591), Leiden: Tandem, tandem iustitia obtinet. Declaracion magistral sobre las Emblemas de Andres Alciato (1615), Najera: TANDEM, TANDEM IUStîtia obtinet. Les emblemes (1615), Geneva/Cologny: A la fin justice le gaigne. Emblemata (1621), Padua: Tandem tandem iustitia obtinet.